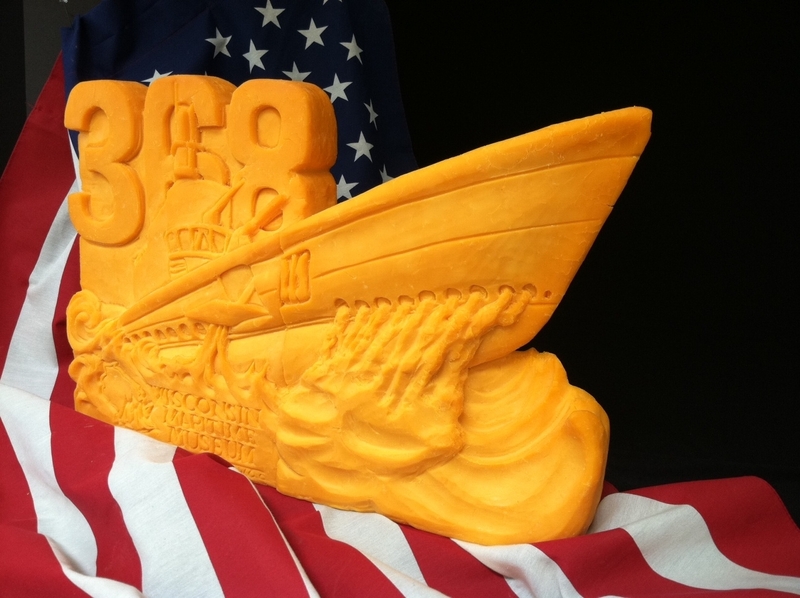 When submarine vets gathered last Thursday in Manitowoc, Wis., they found an accurate – and edible – tribute to their years of undersea service: a 22-inch-long sculpture of attack submarine Jallao made of pure cheese. Behind the conning tower of the surfacing sub is its hull number, 368. Jallao was one of 28 subs built by Manitowoc Shipping Co. during World War II. After commissioning it in 1944, Jallao’s crew headed to the Pacific theater and earned four battle stars – also depicted in cheese. The gathering in Wisconsin last weekend was for vets who served aboard the 28 Wisconsin-built subs and their families. This is not the first naval fromage-homage for Kaufmann. A few years ago, she sculpted a model of carrier Ronald Reagan in Sargento as big as a small boulder.